Tormentium: Dark Sorrow* is an old title that I picked up on Good Old Games** last week. It’s a very dark story, with unique art that is very reminiscent of Geiger, but with a looser style. Without giving too much away, the game follows an unknown creature with no memory, from the point of his awakening in a cage being carried across a bleak landscape by a dirigible, through his journey across that desolate land. The creature is imprisoned but doesn’t know why. Told that it is evil, but doesn’t know why. The entire theme is a very picturesque, macabre statement about good and evil. I found the game play excellent, the artwork enticing but dark, and the story line ingenious. It was a longer game than expected – which is always good – and I was never bored, sometimes tense or scared, and often curious about what was to happen next. BE WARNED: The game graphics are NOT for the faint of heart, and certainly not for children. Especially in the first segment of the game. Death is a huge theme within this piece, and the artwork reflects that. 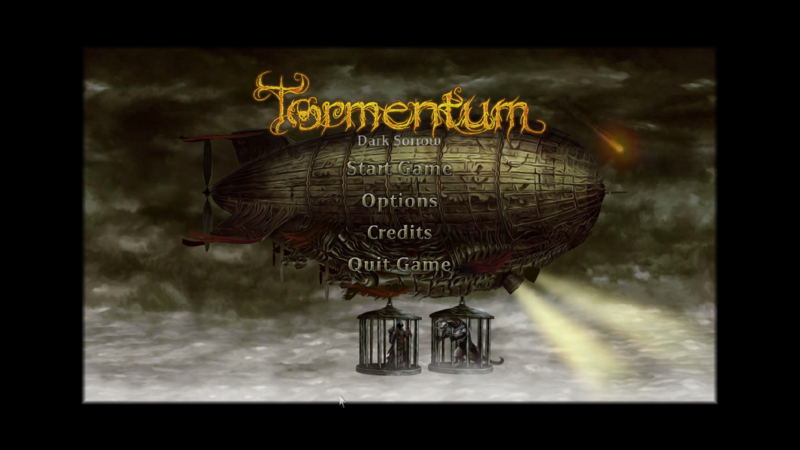 The entire game plays as a point and click adventure. There are no hidden object scenes. Completing a quest or task often yields a reward which the giver drops to the ground or some other surface. Be sure to pick these items up, as sometimes when you leave an area, you can’t go back. Sometimes the same item can be used more than once. Looking at everything can yield drawings saved in your notebook, which provide later clues to other puzzles. Be curious. It pays off. The only (very small) issue I had, was that occasionally arrows leading from an area were too light to be seen against the background. Pay attention to your exits, and if you aren’t sure whether there’s an exit or not, move the view around a bit to catch the edges of the screen against different depths of background. Oh, did I mention that the entire game has artwork that’s a little large for the screen, so you can actually pan back and forth to include extra area in your examination? I found this sort of a neat little trick. One thing to note: You can lose at this game, and will have to replay it in order to win. I’ve just finished the first play-through and lost. Still, I’d have to give this game a 10. It startled me. It was entirely point-and-click, so easy to play. The story line held my attention throughout. The background music was eerie, and if you like dark metal, you’ll love the ending song. I will be replaying it to see the alternate ending very soon! **Good Old Games is a DRM-free game purchase site. They have games ranging from very old classics, to newer pieces, all DRM free. All games run on your system without any sort of internet connection or game client. You can download and hold your entire library on backup, but everything remains accessible through your account online. They have games for Windows, Mac and even Linux!